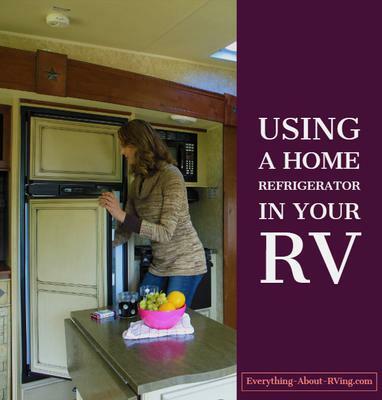 Can I Use A Regular Refrigerator In My RV? My fridge/freezer is not working. Can you simply replace it with a mini fridge like the ones in stores? I don't need the option to use gas. ANSWER: Hi Shane, the simple answer to your question is yes you can use a Standard Compact Refrigerator to replace your RV Refrigerator . But there are some things that you need to consider when doing this. 1. A standard compact refrigerator needs a 120 volt AC outlet to get power. In most cases there will not be a 120 volt plug in the cabinet where your current fridge is. So you may have to install a plug in the fridge cabinet. You will have to be careful when doing this as you do not want to overload a circuit in your RV. 2. You need to look at the specifications of the Compact Refrigerator to determine what kind of airflow is required over the condenser coils of the fridge. Depending on this requirement there may be problems trying to enclose it in a cabinet. 3. If you do any type of boondocking the only time your fridge will have power is if you run the generator. Many RVers have done what you are planning to do and are quite satisfied with the resulting cost-savings of not having to buy an expensive RV refrigerator. Some RVers have solved the air circulation problems by using Home Theater Cooling Fans to circulate the air through the coils. Some RVers have even set up their fridges to run off of a 12 volt DC to 120 volt AC Inverter . Depending on how your house batteries are setup and the wattage draw of the fridge this could require beefing up your house battery system. The bottom line is if you are just planning to plug it into a 120 volt outlet all you have to be aware of are items 1 through 3 that I listed above. Comments for Can I Use A Regular Refrigerator In My RV? It is best to replace an RV fridge with one that is made for an RV. Residential units are not made to take the bumps and motion of the road. Hi, this has been very helpful. We are looking at putting a mini fridge in our camper but for a different reason. We have a relatively new camper (11 months) and just found that the fridge does not have a way for the condensation to drain. The sides of the fridge sweat heavily and it was just being soaked up into the cabinets. We are now rebuilding the cabinets and trying to determine how to make sure the fridge does not do this again. All this to say, is we opt to put in a standard mini fridge, is there anything special that needs to be done for the sweating/condensation? Thank you! My 5th wheel came with a residential fridge. It has 2 additional batteries and an inverter. If you add a residential fridge, you should check if the store will let you test different models with a killawatt to see exactly how many watts/amps you'll need to run it before buying. It should also tell you the peak #s for starting the compressor. A 2000 watt inverter *should* be more than enough for a modern energy star fridge, but make sure it can handle more for a short time when the compressor starts. Also make sure it automatically shuts off AC output if the batteries get too low or it could damage them. Some inverters can be set to only run when plugged into shore power or when power from the tow vehicle is detected. You can add an generator auto start controller and/or solar panels to automatically keep the batteries charged when boondocking. Expect to purchase at least 3 or 4 solar panels to keep the fridge running as well as more batteries to keep the fridge running through the night and on overcast days. Keep in mind those batteries also have to power your heater, lights, etc... as well as the refrigerator. I replaced my frig with a full size model that fit perfectly in the space. When we travel, I just run the generator about every four hours for about a half hour. It keeps things a lot cooler than the Rv frig ever did. Now I don't have to worry about a fire in my frig. This is a common fix, but one thing that must be done, is cap off the gas line not being used anymore. I saw a camper 2 weekends ago that blew out part of the side wall from a propane explosion. Owners of camper had burns on hands and arms. Luckily was early in morning and nobody was outside camper to get hurt. We had a residential refrigerator installed when we purchased our 09 Tiffin Phaeton and love it. The manufacturer included 2 additional house batteries and a 3000 watt inverter which has kept it fully powered with no problems.